1. start: Spin up Processors. 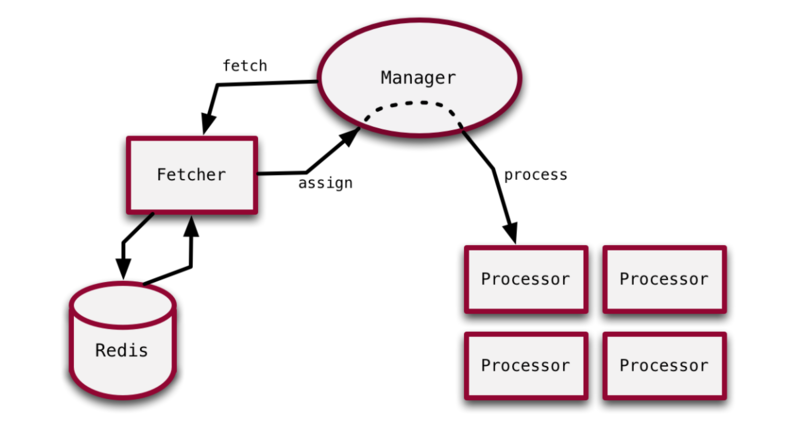 2. processor_died: Handle job failure, throw away Processor, create new one. 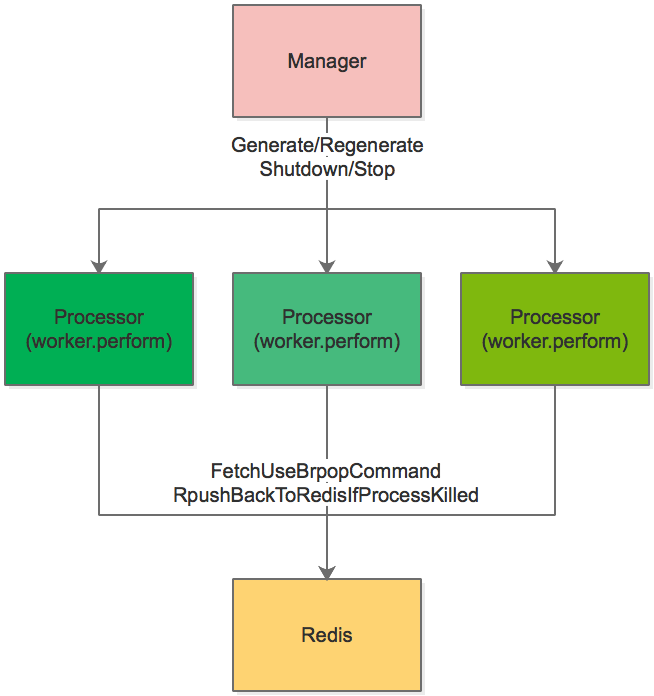 3. quiet: shutdown idle Processors. 4. stop: hard stop the Processors by deadline. # We've reached the timeout and we still have busy workers. # They must die but their jobs shall live on. # it is worse to lose a job than to run it twice. 注意在接收到TERM SIGNAL一些job有可能被重复执行. Sidekiq的FAQ中有说明: Remember that Sidekiq will run your jobs AT LEAST once. Sidekiq 还提供了 Scheduling Job 的功能, 即到时执行任务, 该部分使用了一个 SortedSet 的redis数据结构, 排序的因子为任务的执行时间. 在启动 Sidekiq 服务的时候, 会启动了一个线程轮询所有执行时间小于等于当前时间的队列数据, 将该部分的数据在pop至队列, 再由 Processor 处理. 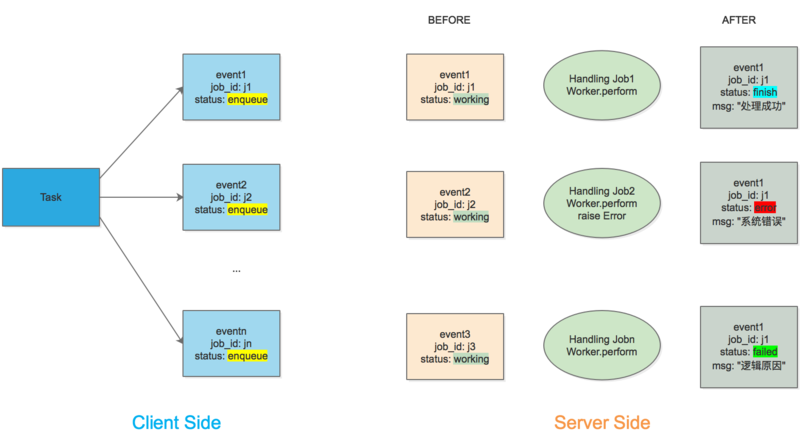 Sidekiq 在 client-side 和 server-side 都支持AOP操作, 该部分和Rack的原理一致. # With Rails 5+ we must use the Reloader **always**. # The reloader handles code loading and db connection management. raise ArgumentError, "Rails 5 no longer needs or uses the ActiveRecord middleware." 在这里我们配置了 use_task_event, 如果需要使用该插件, 需要在 worker 中配置 use_task_event: true. 前端每隔一段时间, 调用后端的接口来询问 task_id 对于的 job 的状态, 如果出错, 则一同返回错误信息.